LAN card. While we were pulling our hair over that, the super computer developed blatantly silly problems of its own. ARGHHH!!! So if my responses to you have been slow or not at all, I apologize. We hope to be able to resolve these issues shortly. days! I'm sorry about that. As a result of all that, this one is not really of record length, but it ranks right up there. Tom Norris (Hampton HS - '73) made page hit # 33,000 Tuesday morning at 9:03. Congratulations, Tom! If you should see Monty Phillips ('62) of VA, please wish him a belated Happy Birthday for me! His birthday was Monday. Terry Seay ('67 - of VA) told me to sign up for the newsletter – so here I am. with Dale Mueller ('64 - of VA) and his wife Lois as well as Terry and his wife Wanda. As soon as you get me hooked up I will send you more info as well photos. Well, THERE you are, Bill! I wondered what was keeping you! GIGGLES! Welcome aboard. Tell everybody Hi for me. just fine. As Napoleon Dynamite said, "LUCK-KEEE!" graders from Magruder to those events.) But I remember watching them perform that in concert - I assume it was the spring concert. WOWZERONI!!! The chills you experienced must have been universal! Their notes still ring in my mind after all these years. twice, but thought my mind was playing tricks! Of course, the other time was the Spring Band Concert. Thanks, Ron! Just to reiterate how memorable these performances are, I have to relate another story in connection with them. presented it several times in several places. ago), and suggested I keep looking until I found it. to express myself. Thanks again for reminding us, Ronnie - and Craig - and Eleanor! their tremendous talent with us all and leaving us to forever recall something that astoundingly beautiful and magical. 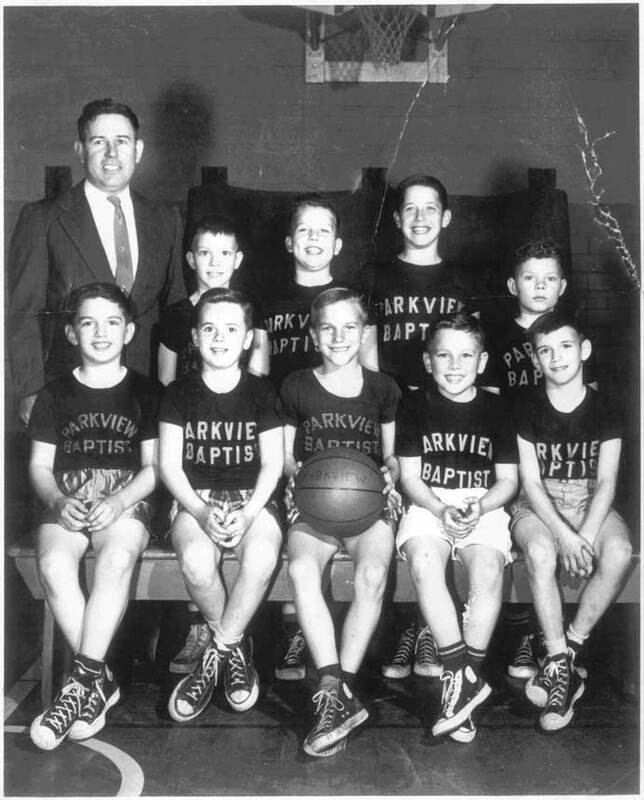 Parkview Baptist Church – Youth Basketball Team – Circa 1958 ? 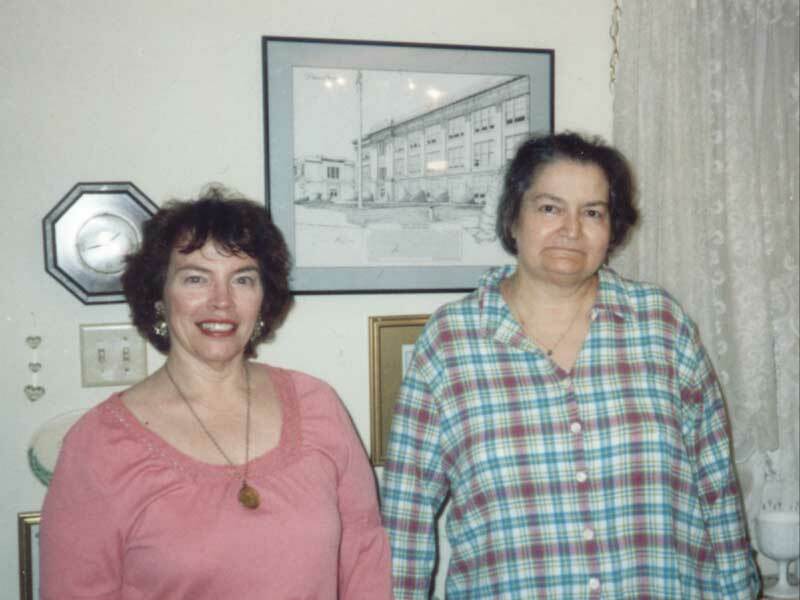 Thanks so much to Dave Spriggs ('64 - of VA) for the picture of the Buckroe fun house. Brought back a memory of when my sister and her boyfriend took me to Buckroe and we went to the fun house.......he was leading, she was in the middle, I was last........I got so scared as soon as we entered, that I backed out and went outside and waited for them!! I don't remember how old I was......and I'm not sure that I ever went inside the fun house again! But I like the mirrors and truly LOVED the roller coaster...... my sister never rode it! Anyhoo, I sent her the picture, so thanks again, Dave. A friend just sent me a Daily Press clipping about the money that Dr. Herbert Neisser donated to the Hilton Library. I did not know he died on New Year's Day. I looked at the newsletters from then, but didn't see him mentioned. Fortunately for me, Dr. Neisser "fixed" my mother, then I was conceived. 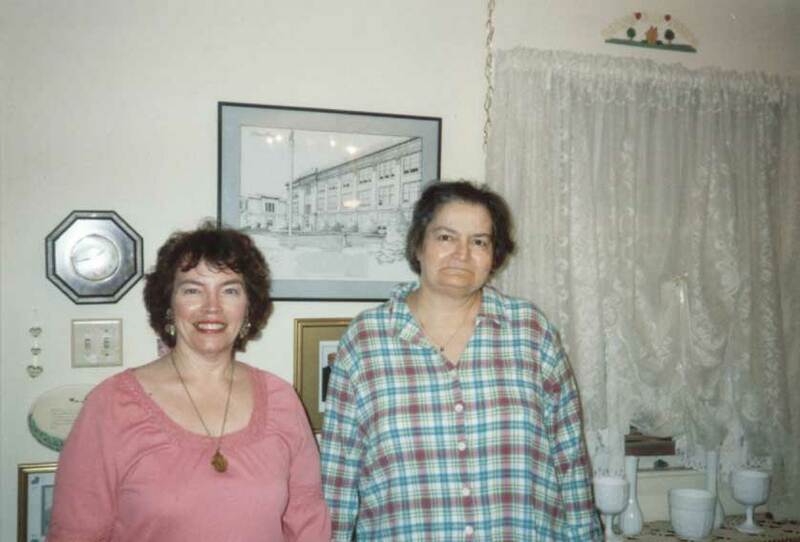 He delivered me and treated me through two hospital stays for pneumonia, many strep throats until the tonsils were removed, and various ailments until high school. And I was surprised to learn he was only two years older than my mother.......she turned 92 on Apr 12th! I know there are LOTs of alumni out there with a Dr. Neisser experience. Please share. Thanks, Gloria! 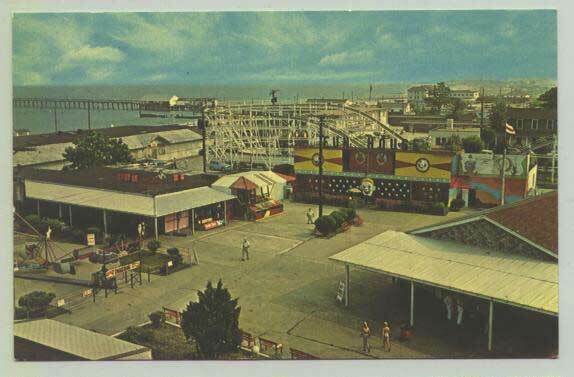 How I loved that Fun House - and the Roller Coaster was my absolute favorite! Amusement Park would be one of the first places I'd visit, too! I'm sorry I didn't pick up on Dr. Neisser. My own physician was Nowell D. Nelms, M.D. in Southampton Shopping Center. just really, really wanted to be born - and I suppose you did, too! to Carol" - which I am doing. I visited your website, http://www.nnhs65.00freehost.com/NNHS-Newsletters.html. away. There was no TV to stare at in silence at this juncture, you socialized with those up and down the barstools. energy I would plan a visit to NN just to get a look. carriers were finalized between barstools at Rays over a few beers. That's the way things worked in my hometown. function. Wish I was close enough to drop in there for a beer tonight, and chat up the folks on adjoining bar stools. The name's a joke, obviously. But what the modest neighborhood tavern lacks in swank, it makes up for in history. big plans for its future. the bar is the original marble soda-fountain counter from the building's early days. everybody a round of drinks: "Inney one dares to ring this bell will set the house up also - The Waytres." Add a couple of pool tables and dartboards, and a jukebox with plenty of country tunes, and you've got it. they find it a friendly haven. followed by his son Ray Jr.
likewise a neighborhood fixture for many decades. Part of the building also once housed a barbershop. the senior Ray as a sportsman and referee who liked to sponsor youth sports teams, and who also put on a popular annual crab feast. councilmen and shipyard executives. "Many a ship was built in those booths." "I never thought of this as a true bar," he added. "It was always nicer to be here than in other places." to the restroom, Adams emptied half his glass and refilled it with water. shoulder. I reached up my hand and patted him back. Then the door opened and closed again when he went out. "The customer asked me, Did you see him? I said yes, and he said, I didn't see him, and I'm gone." took over from Kennedy half a year ago - have worked to bring in more business by having karaoke nights and occasional live bands. Ray's now has a regular food menu featuring shrimp, clams, wings, franks and nachos. and an old-fashioned wood-burning stove like it originally had. He's already got an old player piano (no piano rolls, though). He also hopes for bigger kitchen facilities, someday serving wine in addition to beer, and maybe adding an upper-level indoor deck. One other big thing is going to change at Ray's: the name. Kilburn said it'll be known henceforward as the Hilton Tavern, "as soon as I get the new sign." people's country club," said his son. The problem, Kilburn said, is some people take it literally. "We get calls asking us for the tee times, or asking if the tennis pro is in." Also, he believes the place has lost business from potential customers who see the name and think it's a private club. at the Hilton Country Club." But the regulars predict that physical alterations and a new sign won't change the place's friendliness or bother the current clientele. "You have second- and third-generation customers here," said tavern manager Debra Bradbury. Said Kilburn, "To some people, it'll always be Ray's." WOWZERS! Thanks for sharing this with us, Tom - and thanks for the referral, Fred! This was a bit off my beaten path for me to add anything. How 'bout the rest of y'all? and am having a hard time seeing. Hi, Ilene! It's so good to hear from you again! I've mentioned several times in the past my belief that there are no such thing as "coincidences". them, and just have the greatest time opening my "treasures". came to visit me. I had not heard from her since then. See why I just can't grasp and accept the concept of "coincidence"? I didn't fall down, but I did - really! at the Point Plaza in Newport News. Thank you for solving that mystery for us, Kathy! included a history lesson about the Earl of Warwick in his story. sounded like a very pretty, magical place to me - full of crayons and other delights. to add my thanks for what you do. Just wondering...did anyone hear how many cards Mr. McIntosh received for his birthday? I was wondering the same thing. But no, I never heard. Perhaps Thelma did. What is not so funny is that I realized that I had never made Mr. Mac's page - so I shall do that this afternoon. Thanks for the reminder - and the kind words, Lydia! in tenuous health right now – so don’t be surprised if you hear something about him also. will happen to all of us in our own time. Sigh. I'm so sorry to hear about Mr. Mac's health, Thelma - but thanks so much for letting us know. better those cards than the sympathy ones. Typhoons, forever!! Amen to that! Thanks, Lydia! new e-mail address. It is blearnhardt@cox.net. Thanks for the great e-mails. I see on your site that Gloria (Woolard) Price (Hampton HS - '65 - of FL) asked about the Sock Hop. If she, or anyone else, wants info, etc., have them email me at skierdancer@verizon.net. Thanks. I hope your turnout for that is as incredible as the adventure itself will be, Raoul!